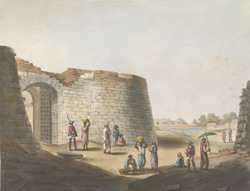 The South Entrance Into The Fort Of Bangalore. bl.uk > Online Gallery Home	> Online exhibitions	> Asia, Pacific and Africa Collections	> The South Entrance Into The Fort Of Bangalore. Plate seventeen from 'Picturesque Scenery in the Kingdom of Mysore' by James Hunter (d.1792). This aquatint, which is based on an original composition by Hunter, shows the south entrance to the fort inside the city of Bangalore. Originally constructed in the Sixteenth Century out of mud-bricks, the fort was rebuilt in stone by Haidar Ali (c.1722 - 1782), the king of Mysore, in 1761. The palace of Tipu Sultan (1753 -1799) was built inside this fort. Tipu Sultan and Haidar Ali were enemies of the British, and waged four wars against them. The fort was captured by the British in 1791 after a fierce battle commanded by Charles Cornwallis (1738-1805).